This is my submission to Deb for this week’s Souper Sundays, to this month’s Four Seasons Food Challenge, to this week’s Healthy Vegan Fridays, to this month’s My Legume Love Affair, to this month’s Bookmarked Recipes and to this month’s Eat Make Grow Blog Hop for picnic eats. 1. In a small bowl, combine dressing ingredients: tahini, lemon juice, apple cider vinegar, water, Bragg’s/soy sauce, maple syrup and curry powder. 2. 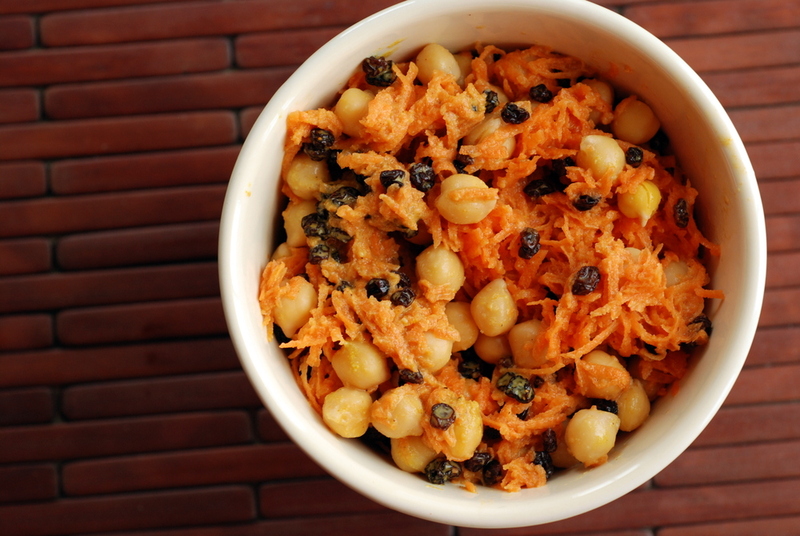 In a larger bowl, stir together chickpeas, carrots and currants. Toss with as much dressing as desired. I must have missed this one over at Choosing Raw. Looks good to me though. I’m a little obsessed with fruit (dried or fresh) in salads, chickpeas are my favourite bean, and I add tahini to everything! I noticed I’ve made no.1 and no.3 of your best salads so I better get on with no.2 when I next get a good mango. Haha, glad you don’t mind me bombarding you with recipes! I’m going to try that health is happiness tonight. The sauce sounds intriguing…Have a good Sunday! YUM – this looks *so* good! I think this may be my new favourite salad! Currently it is a black bean, cucumber, tomato & avocado salad with lime/olive oil dressing. It’s super tasty, but I’m excited to try this. Alas, no. The dressing looks great, but icky desiccated-but-simultaneously-squelchy-ugh currants. More for you this way, though, right? 😉 And hey, at least I like chickpeas and tahini! 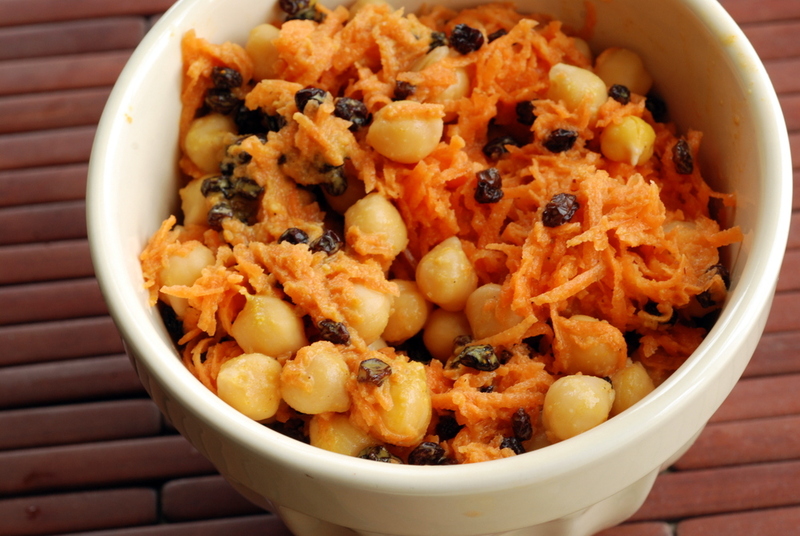 I’ve made a similar salad with shredded carrots and raisins, but I hadn’t thought to add chickpeas – they would go perfectly with the curried tahini dressing while bulking up the meal at the same time. I love chickpea salads, so I’ll have to add this to the list, especially for potlucks! Looks like a mighty fine salad to me. I love chick peas but can’t say I eat them much outside of hummus and stews, but I’m reckoning this recipe could be my turning point! Divine line of ingreds. Thanks so much for entering the Four Seasons Food challenge, would make the perfect picnic addition. I agree with everything Louisa just said above! Love the tahini in there – it’s so good used like that as a dressing. I’m bookmarking this one. Thanks! I just made this..and then.. I ate almost the entire bowl! It was soooo good! Thoughts on substituting dried cranberries for the currants?